A freakish anomaly spawned from experiments with a new pesticide, the Tri-Onion quickly grew to human size and began a rampage of violence and destruction. His hideous breath forced eyes to water, and his tremendous strength and near mindless ferocity caused millions of dollars in property damage. 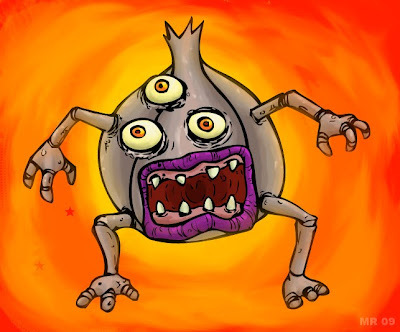 The Tri-Onion was last seen fleeing into the vast forests of the Pacific northwest. Most scientists believe the Onion has long since perished, however sporadic sightings still occasionally occur.